For years and years, we thought the pioneering Pico Canyon oil driller Charles Alexander "Alec" Mentry died from an allergic reaction to a bee sting. Then, around the year 2000, roughly the 100th anniversary of his death, we learned another story, purportedly passed down from his daughter-in-law. It said Mentry was repeatedly bitten on the lips by conenose bugs (genus Triatominae) — thus their alternate name, kissing bugs — and he went to the hospital, contracted pneumonia or liver failure or both, and died. Either story was fairly plausible; bees and conenose bugs are prevalent in Pico Canyon. Now (2014) comes historian Ann Stansell with Mentry's actual death certificate showing neither insect was the proximate cause of the driller's death. Was he stung by bees? Maybe. Was he bitten on the lips by bugs? Stranger things have happened. But according to the attending physician, John R. Haynes of 929 S. Main St., Los Angeles, Alec Mentry died at California Hospital, 1414 S. Hope St., as a result of typhoid fever, with chronic nephritis as a contributing factor. So at least the idea of liver failure was sort of close. Nephritis is kidney disease. According to Dr. Alan Pollack, who is both a Santa Clarita historian and a physician, chronic (preexisting) kidney disease would have nothing to do with a bug bite — and neither would typhoid fever, which would likely have come from something he ate or drank. "Maybe (the daughter-in-law) associated the bug bite with his worsening condition, but in fact he was suffering the effects of typhoid fever," Pollack posits. "The bug bite, if it truly occurred, could have been a red herring or coincidence." Moreover, Pollack says: "If the doctors were convinced that he died from an allergic reaction and pneumonia from a bug bite, at the least they would have listed anaphylactic shock and pneumonia on the death certificate." They said he succumbed to typhoid fever after contracting it 35 days earlier and being hospitalized for all or most of that time ("1 mo."). They don't say how long his kidneys had been bothering him. A 35-day period of illness is consistent with the characteristics of typhoid fever, Pollack says. "Today," Pollack writes, "typhoid fever is treated with and responds well to antibiotics, but there were no antibiotics in 1900. Alex Mentry may have suffered an untreated and fatal course of typhoid fever which lasted a typical 35 days. "In the first week, he may have experienced intense abdominal pain, constipation, cough, headache, delirium and a stuporous mental state. By the end of the first week, he could have had fevers to 104 degrees and a rash. These symptoms typically worsen in the second week. The third week might have found him even sicker, not eating, having diarrhea and losing weight. He could have become confused and even psychotic. Death usually occurs in the fourth week due to overwhelming infection, inflammation of the heart or bleeding in the intestine. "Of note, typhoid fever can be passed only from human to human via contaminated food, water or hands. Therefore no bug could have given Alex Mentry typhoid fever." At least the date is consistent with our records. It shows he died Oct. 4, 1900. 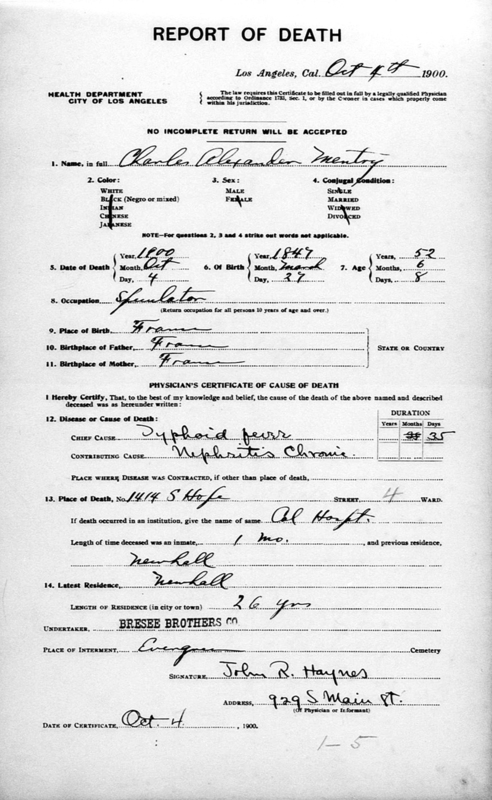 The certificate gives a birth date of March 27, 1847, making him 52 years, 6 months and 8 days old at time of death. Born in France to parents who were also born in France, he's listed as white, male, and married. His stated occupation is "speculator" — which of course refers to oil exploration but also provides editorial comment on the way we've handled his cause of death up to this point. AS0001: 19200 dpi jpeg from smaller jpeg.